I remember the first time I saw "To Kill A Mockingbird," I was in fifth grade. It was for an enrichment program at my grade school, where we learning mock trials and mock debates. While we watched the entirety of the movie, we had to pay very close attention to the courtroom scenes near the end of the movie. I didn't have the love for all eras of cinema that I had at the time I saw this. I remember not being particularly excited to see it, but any day to watch a movie in class seemed like a good day. Then the movie started and I was positively lost in it. I had never felt what I was feeling due any movie of its kind in a long time. I felt my love for film reborn over the course of three or so class periods. I think it was this point when I started taking the history-wide, world-wide pantheon of film more seriously, and I am sure glad I did too. I think I was affected by it because we view this world through the eyes of Scout (played by Mary Badham). The movie takes place during a time when children would play outside all day without much supervision, and they always got home safe. This takes place during a time when creepier neighbors only created striking urban legends and nothing more. The film's small town gives us a sense that everybody knows each other, and everybody knows each other's business. There is a simple sense of innocence with Scout, even as she is reacting to her brother Jem (Phillip Alford) or her father Atticus (the sensational Gregory Peck) and new friend Dill (John Megna). Through the movie I learned that sometimes, people grow up fast. "To Kill A Mockingbird" is definitely a story about losing innocence fast, about growing up at a rapid pace. Both Jem and Scout are exposed to racism very early in their lives, as well as the affects of poverty. It is a terrifying placement to put on children, and both Badham and Alford do great work bringing these young characters to life. 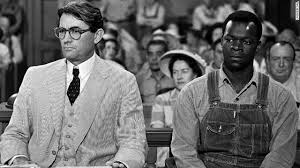 Atticus Finch is one of the greatest heroes ever created from popular culture and Gregory Peck does extraordinary work as the character. He is a loving father, but also a stern father. He allows his children to almost raise themselves, while also providing a helping hand when needed. When the children start asking the difficult questions of the movie, he always seems to know exactly what to say. We believe in everything Finch does and Peck is careful and confident to make sure we feel everything he does. The courtroom scenes are some of the most gut-wrenching scenery of any movie from that time period. Full of classic scenes and classic dialogue. Its sad because as good as a lawyer Finch is, the game was fixed from the start. I learned that even when good people try, sometimes the outcome is bleak and dour. Sometimes the bad in this world still prevails. But in such a sad world, how do we adjust? How do we keep living happy lives and fighting the good fight? Through the strength of family, is what I felt this movie suggested and it is hopeful throughout all the darkness. If by some reason you haven't had a chance to see this movie yet, or if you have read the book but still have not got around to seeing the movie. I hope you do soon.